"We make the best swimming goggles in the world, and have for over 20 years. 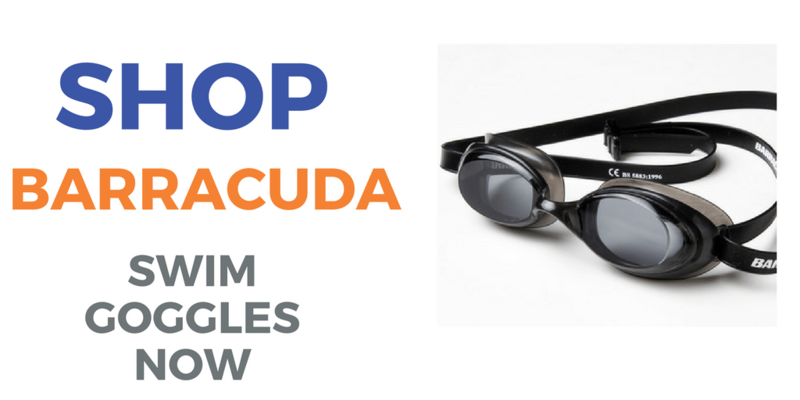 Invented by Dr. John Runckel in 1979, Barracuda goggles continue to be the brand of choice for serious swimmers. Technically advanced materials combine with ingenious Positive Pressure frame to provide the swimmer with a goggle completely leak-free and comfortable. From the first Standard frame, Barracuda has now grown to include many different types of frames and seals. Barracuda's products have also expanded to include a number of different types of headwear, accessories, and hair and body care products. We understand why you swim, because we swim too. Our mission is to give our customer the most comfortable aquatic environment possible. Swimming is important. It's a great form of exercise and means something different to each individual who participates. Thank you for choosing Barracuda products. What Positive Pressure, means to you is comfort. No suction, no pain, no marks. The underlying frame of Barracuda Positive Pressure swim goggles fits the bone structure of the eye socket. While facial anatomy can vary, the eye socket is relatively the same. Barracuda's frames match the contours and curvatures of the eye socket. In addition, Barracuda uses an ultra-soft, closed-cell sponge to seal against the skin. This material closes any gaps that remain between the frame of the goggle and the face. By applying this patented technology, Barracuda Positive Pressure goggles are able to seal out water without painful suction. With a suction seal goggle, the goggle shape must allow the sponge or flange to be pushed into the skin. The basic suction principle then takes over. Since a suction goggle only matches the face partially, the facial tissue must be pulled to the goggle to complete the seal. The facial tissue is attracted to the goggle with negative pressure, suction. There is very little tissue to move near the inner corner of the eye, so if the goggle doesn't match fairly closely with the general eye socket shape at this point, it won't develop a suction. This general shape of the eye socket has been described by some as round or oval. If the area has a narrow, rather acute angle around the inner corner of the eye it's described as oval. If the angle is broad it is generally described as round. After checking this area of the goggle frame has to be wide enough to cover the depression outside the outer corner. At this point, a soft sponge or flange must at least be close to the skin all around the periphery of the goggle. By compressing the sponge and pushing in on the frame, air is pushed from beneath the goggle creating the necessary negative pressure to keep the tissue pulled against the frame. This is why coaches have told swimmers for years that for a goggle to work it has to stick to their face with suction. For a long lasting seal the sponge must be pulled 1/8 inch or more into the tissue. Otherwise the seal tends to break each time the swimmer takes a breath, because the shape of the tissue changes. This long lasting seal also leaves red rings, and occasional swelling around the eyes by limiting blood flow and lymphatic return around the eyes. Even with suction goggles the shape of the frame determines the fit. We have searched the world for the best fitting, most comfortable suction seal goggles, and offer them as our Barracuda Suction Seal swim goggles. Nosebridge adjustments are less precise on suction seal goggles and some, like the Electra, have a fixed nosebridge. These are great goggles for convenience. Overall frame size is more critical on suction seal goggles, because of the areas at the inner and outer corners of the eyes. If a goggle is too large, it tends to lose the suction seal at the outer area of the eye and temporal area, especially while taking a breath. If the frame is too broad, or too "tall" it won't fit into the inner corner of the eye closely enough to cause suction. Too small a frame either won't seal at all, or impinges on the field of vision. Goggles meant for small face sizes are often referred to as "juniors". Defogger, Hard Cases, Earplugs Noseplugs, etc. Step Diotper: Pre-fabricated goggles made in spherical prescriptions only. Same power in both eyes only. Available in -1.00 steps (i.e. -1.00, -2.00, etc.) up to -8.00. (see prescription information for how to determine the proper prescription) Made of CR-39 optical plastic. Fog Resistant: Polycarbonate lens with fog resistant coating.